The city of Santa Cruz received a total of $29,000 in Carnegie funds, $20,000 for the main library and, later $3000 for each of three branches. All four buildings were designed by W.H. Weeks. The 1904 Romanesque Santa Cruz/Main was his first Carnegie library commission and the 1921 Craftsman Eastside was his last. 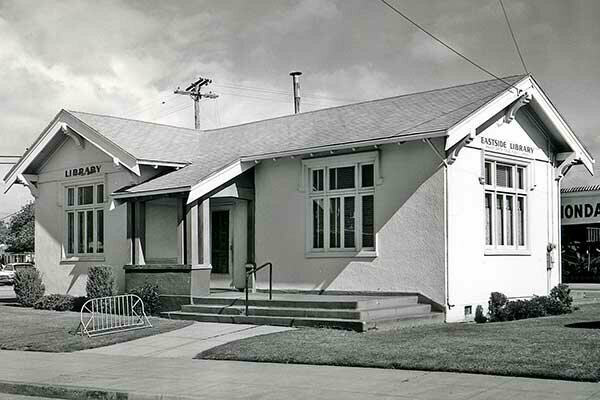 Upon completion of the Seabright Branch Library in 1915, ladies of the Eastside area were among those seeking the next branch. Eastside residents raised $1,500 to supplement the Carnegie funds and Weeks' plans were put to bid in the summer of 1920. The building, a small frame bungalow, was almost a duplicate of the Weeks' Carnegie library in Yolo. The builder was George W. Reid. The library opened September 24, 1921. By 1931 additional shelving was installed and from 1951 on a new building at a new site was strongly advocated, with Eastside residents insisting the old site must revert to a park. The new branch was built in 1966, the old library was demolished in 1968, and the site was re-landscaped as a park by the city.